Blowers can operate either as exhausters or compressors and are designed for continuous operation. Full die-cast aluminium construction grants the maximum sturdiness. They can be used both for industrial and standard applications because there is no need of lubrication between the static and rotating components, the noise level is low thanks to dedicated silencers (suction and exhaust), they can be fi tted with frequency converters, their layout can be either horizontal or vertical and they can be fi tted with single phase or three phase, multi-voltage and multi-frequency motors. Customized construction according to ATEX 3GD and 2G are available upon request. The gas enters through the inlet 1 . As it enters the side channel 2 , the rotating impeller 3 imparts velocity to the gas in the direction of rotation. Centrifugal force in the impeller blades accelerates the gas outward and the pressure increases. Every rotation adds kinetic energy, resulting in further increase of pressure along the side channel. 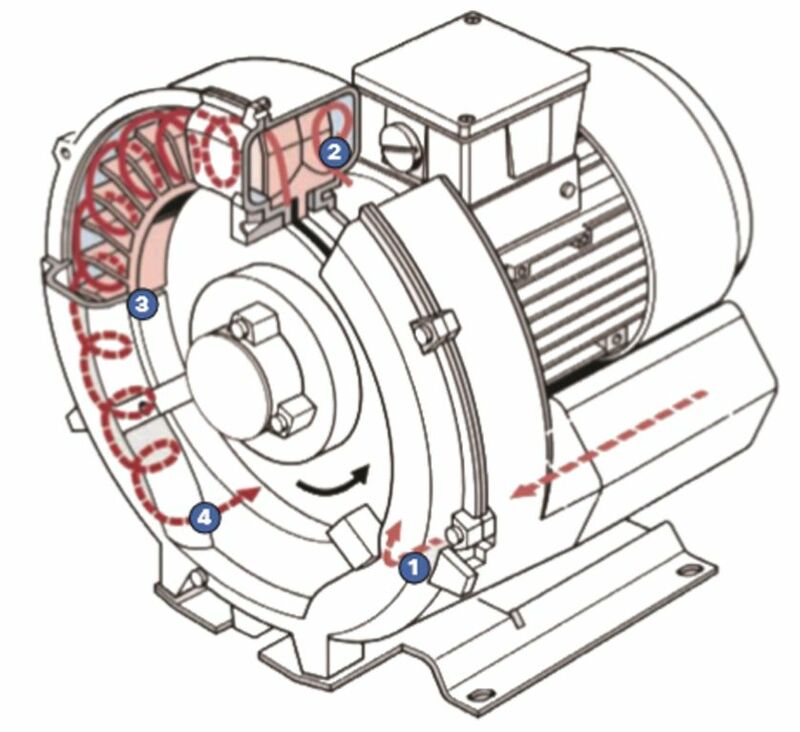 The side channel narrows to the rotor, by pushing the gas far from the impeller blades and discharging it through the outlet silencer 4 from which it gets outside. 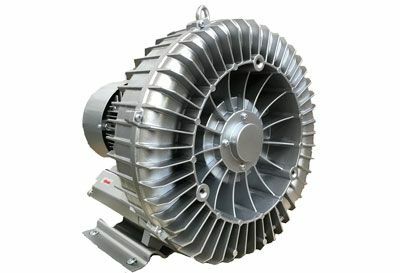 Blowers and exhausters of the SC series are made of painted aluminum alloy. This product line is produced in M single-stage version (for example: SC601M), in S double-stage in series version (for example SC602S) and in P double-stage parallel version (for example: SC602P). They do not need any lubrication because there is no contact between the static and the rotating components and bearings are permanently pre-lubricated. Blowers can work both vertically and horizontally as well while working in compression as in suction. The devices are manufactured according to the following norms: EN2006/42, EN ISO 12100:2010, EN 60204-l:2006+AC:2010, EN2014/35 e EN2014/30 and according to the following ones EN-61000-6-4:2007 and EN61000-6-2:2005, compliant to 2004/108/CE norm.